Everyone is welcome at the West Toronto Lawn Bowling Club – come try us out for free! Interested in trying a new sport or getting to know your neighbors in The Junction community? Please join us for a truly relaxing and social outdoor activity! Everyone is welcome to join! We just ask that you wear a pair of flat-soled shoes that won’t rip our precious grass. These can be sandals, running shoes without cleats, whatever. We’ll show you the rest and supply you with all the equipment you need. Your first game is free! Guests are welcome to use their free trial during Tuesday and Thursday evening bowling (please arrive no later than 7 p.m.). Please note that we can only accommodate four free players per evening. EMAIL US at least a day in advance with the date on which you’d like to join us so can arrange to have an instructor meet you early for a quick tutorial before the games begin. It’s first come, first served, so we may ask you to reschedule if we’re full on the evening you wish to play. If you enjoy it, you can join us for a full season of unlimited play for just $100. Or, if you’d prefer a more casual commitment, for just $20 you can buy a coupon good for four single games. Want to look like a pro or show your love for lawn bowling? Check out our wide array of witty and wonderful lawn bowling, bocce and curling gear at the WTLBC store. Love lawn bowling? Then “Like” the WTLBC on Facebook! The West Toronto Lawn Bowling Club is now on Facebook. Check us out for regular updates about the sport and to see photos from the club. Find our Facebook page at facebook.com/torontolawnbowling. And if Twitter is more your thing, we’re there, too, at twitter.com/tolawnbowling. From birthday parties to corporate team-building, the WTLBC in The Junction is the place to hold your event! DUE TO OVERWHELMING DEMAND, WE ARE NO LONGER ACCEPTING EVENT BOOKINGS FOR 2018. PLEASE CONTACT US NEXT SEASON. THANKS FOR YOUR INTEREST. Looking for something fun and easy for that special event, such as a birthday or team building exercise? 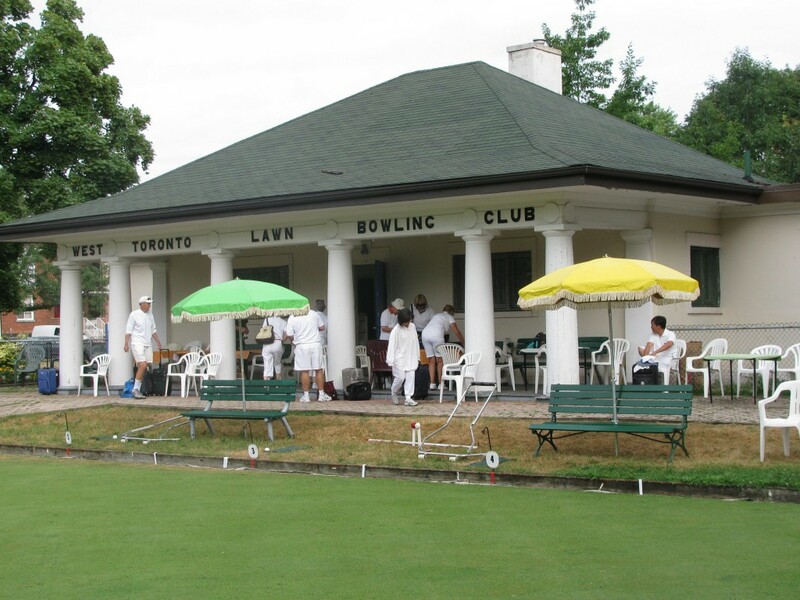 The century old West Toronto Lawn Bowling Club and its iconic clubhouse is the perfect venue. If you are interested, please CONTACT US with the date, time and the number of people you expect at your event. • We request a donation of $25 person person, minimum $250. • The length of your event can vary based on the format you wish to use (single-game, multi-game tournament, etc.). On average, events take about 1.5 to 2 hours to complete, and we’re happy to help you set up teams in advance so everything runs smoothy for you and your guests. If your event is in the evening, it must wrap up by 9:45 p.m. as our permit only allows us to use the facilities until 10 p.m.
Give lawn bowling a try at the WTLBC Open House on June 3! 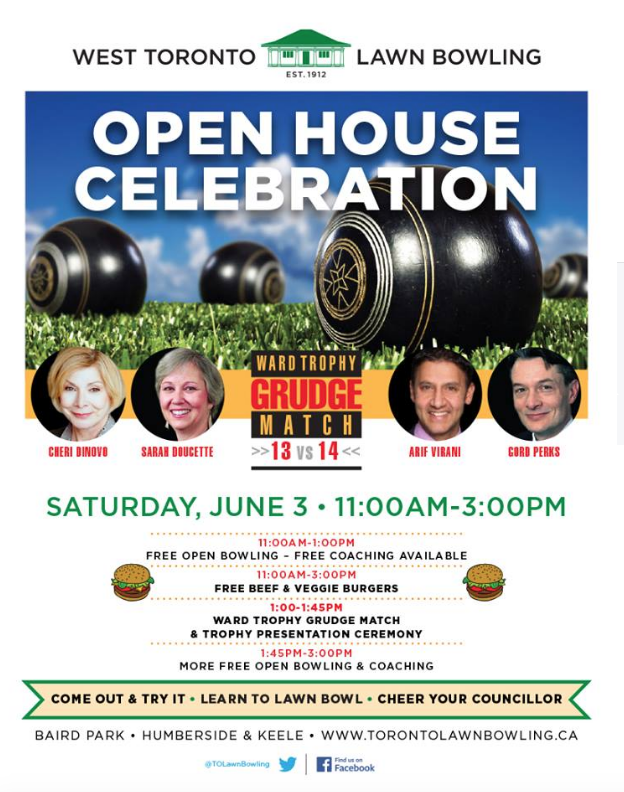 Come on over to the West Toronto Lawn Bowling Club any time from 11am to 3pm on Saturday, June 3 for free bowling and free burgers (both veggie and beef)! It’s an excellent chance to meet your neighbors and try some bowling. Plus, Councillors from each of the surrounding Wards will once again battle in the Grudge Match for the coveted Ward Trophy. Cheer, or jeer, as you wish! See everyone on the greens! If you have any questions, don’t hesitate to contact us, or tweet us at @TOLawnBowling or reach out to us on Facebook. It would appear everyone who attended the 2015 West Toronto Lawn Bowling Club’s 2015 Open House left happy, but the smiles sported by Ward 14 Toronto City Councilor Gord Perks was a little bigger. Perks, along with Provincial Parliament member for Parkdale-High Park Cheri Dinovo and club members Edward Fraser and Steve Shallhorn, defeated a representative Ward 13’s Sarah Doucette‘s office, Chris Haskim, who was teamed up with Peggy Nash, Member of Parliament for the Parkdale-High Park, and WTLBC members Stephen DeKuyper and Sue Watson. It was the fourth annual “Grudge Match“, which is held each year at the WTLBC Open House. If you’d missed the Open House but would still like to try lawn bowling, come out for a free lesson and game any night we’re open. Hello fellow Junctioneers! 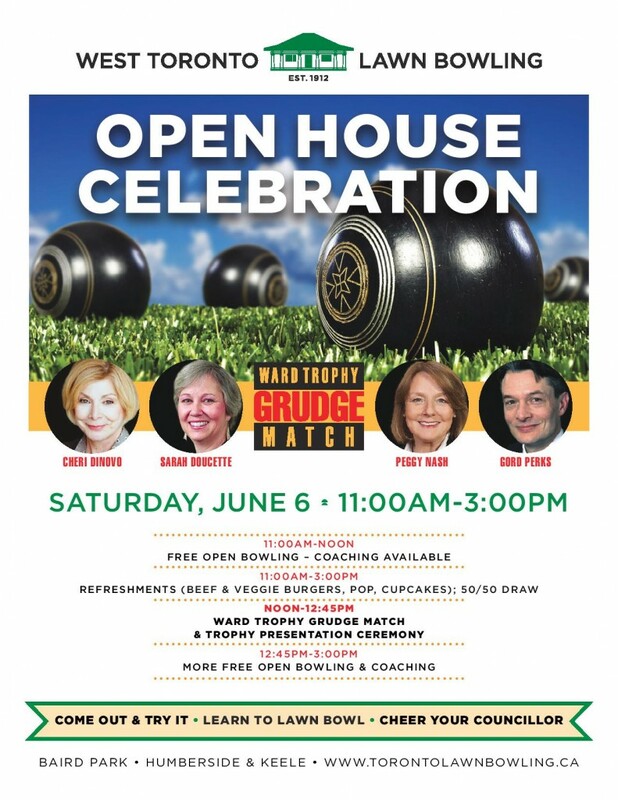 Drop on by the West Toronto Lawn Bowling Club any time from 11am to 3pm on Saturday, June 6 for some free bowling and (very) cheap eats. It’s an excellent chance to meet your neighbours and try some bowling. The bowls were rolling and the sun was shining on West Toronto Lawn Bowling Club in the Junction. 2015 has officially started and we welcome members back to the new year. New players are welcome anytime for an introduction to the game. Thank you everyone for making opening day a great success! See you on the greens. Greeting members and potential new members. 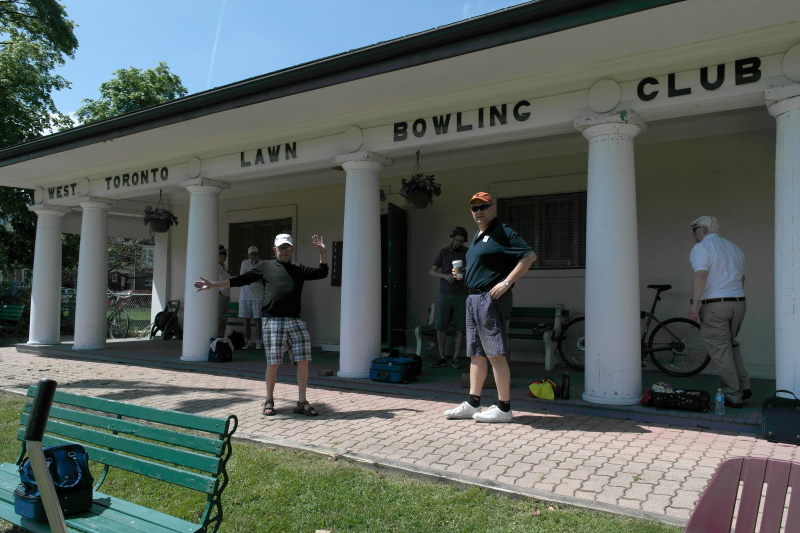 We’ll be holding the West Toronto Lawn Bowling Club AGM on Saturday, May 2 at 10:30 a.m. at the clubhouse. Everyone is encouraged to come. We’ll be discussing a variety of topics, including new fee structures, coaching etiquette and much more. If there’s something specific you’d like added to the agenda, please email your item to torontolawnbowling@gmail.com. Can’t wait to see every one there! In early January, Ward 13 Councillor Sarah Doucette accepted the 2014 Centennial Cup from WTLBC past president Steve Shallhorn. During the WTLBC’s summer open house “Grudge Match”, Doucette led her Ward 13 team to victory over Ward 14 to reclaim her 2012 crown, the first time the Centennial Cup was awarded. 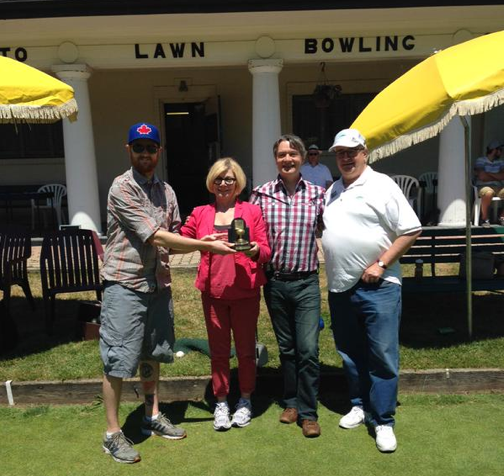 The Centennial Cup commemorates the 100th anniversary of the West Toronto Lawn Bowling Club . Councillor Gord perks led Ward 14 to Victory in the 2013 Grudge Match. This year’s open house will be Saturday June 6 and will feature a free introduction to the sport and free coaching. The Grudge Match between Wards 13 and 14 will start at noon sharp. Copyright © 2017 West Toronto Bowling Club. All Rights Reserved.